Thiruvarangathu Amuthanar adds that the reason for his being able sing paeans of Sri Ramanuja is only due to limitless compassion of Acharyar on the lowly self through the merciful Koorathazhwan. None else than the most merciful Ramanuja can make the lowly, unworthy get some credit. The ones who keep his Lotus feet on their head are indeed fortunate and will not grieve for anything in life. On the occasion of Thai Hastham marking the birth anniversary of Swami Koorathazhwan, I had posted in detail on the greatness of our Acarya ~ here is something more .. .. Miles away on the northern tip of this great Nation existed the Sharda Temple located in Kishanganga Valley just across the Line of Control (LoC) in Pakistan-occupied Kashmir (POK) in a small village called Shardi at the confluence of River Kishanganga and River Jhelum which flows from Kashmir. A famous learning centre of Kashmiris, it is identified by noted historians and chroniclers. As we proceed, here is something read on Kashmir in a book titled ‘the Valley of Kashmir’ by Waltair RR Lawrence published in 1895. Kashmir in 1887, when the Settlement commenced, may be described as an absolute monarchy. If an aristocracy of power ever existed, the tall poppies were cut down years ago, and the people looked to the Maharaja as their direct lord and master. They yearn for personal rule centred in one man, and they are bewildered and disgusted when rule and power filter into many channels. In Kashmir the Maharaja is represented by a Governor and it is of the highest importance that this official be a man of energy and experience, and that all departments, whether revenue, police, forests, &c., should be absolutely under his control. It is a small country, and an energetic Governor could visit any village in the valley in a day's ride. His Highness the Maharaja Pratab Singh, G.C.S.I., recognizing that it was impossible to check these abuses without records and statistics, resolved on effecting a land Revenue Settlement of his country. At first it was extremely difficult to persuade the people that the Settlement would be a reality, or to inspire them with a belief that there would be some continuity in the administration. Little by little, confidence has sprung up. IF one looks at the map of the territories of His Highness the Maharaja of Jammu and Kashmir one sees a white foot-print set in a mass of black mountains. This is the valley of Kashmir, known to its inhabitants as KasJiir. Perched securely among the Himalayas at an average height of about 6,000 feet above the sea, it is approximately eighty-four miles in length, and twenty to twenty-five miles in breadth. North, east, and west, range after range of mountains guard the valley from the outer world, while on the south it is cut off from the Panjab by rocky barriers fifty to seventy five miles in width. The valley is a resting-place for adventurous traders who seek the distant markets of Yarkand and Central Asia, and it furnishes a base whence military operations have been in recent years directed against the wild and turbulent tribes of the Shinaki country to the north and north-east. The mountains which surround Kashmir are never monotonous. Infinitely varied in form and colour, they are such as an artist might picture in his dreams. Looking to the north one sees a veritable sea of mountains, broken into white crested waves, hastening in wild confusion to the great promontory of Nanga Parbat (26,620 feet). To the east stands Haramukh (16,903 feet), the grim mountain which guards the valley of the Sind. On it the legend says the snow only ceases to fall for one week in July, and men believe that the gleam from the vein of green emerald in the summit of the mountain renders all poisonous snakes harmless. Further south is Mahadeo, very sacred to the Hindus, which seems to almost look down on Srinagar, and south again are the lofty range of Gwash Brari. I salute the great mahaan Srivathsa Chinha Misra (Swamy Koorathazhwan) whose Sri Sookthis became the thirumangalyam of the mother Veda (The 4 Vedas also named as Thrayee as mentioned in the above thanian). Swamy Kuresar was born in 1010 in Kooram near Thirukachi. He was destined to be totally influenced by the teachings of Sri Ramanujar. 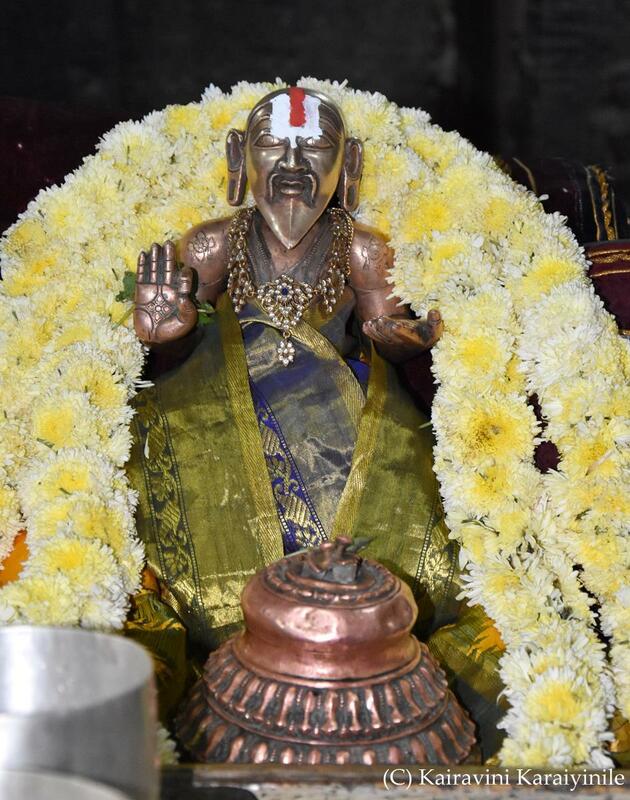 In those great days, when Sri Ramanujar lived in Thiruvarangam in the service of Namperumal, Yathi Raja had succeeded in the stupendous task of systematising an exciting and epochal new philosophy, ... to give it polish of irrefutability, before it could go into and earn an unchallenged place in the annals of Vedantic history, Ramanuja wanted access to ancient parchment or document called ``Boddhayana vrutti'' - a rare exegetical treatise on Vyasa's ``Brahmasutras'' incorporating the insights of other great commentators of distant past. 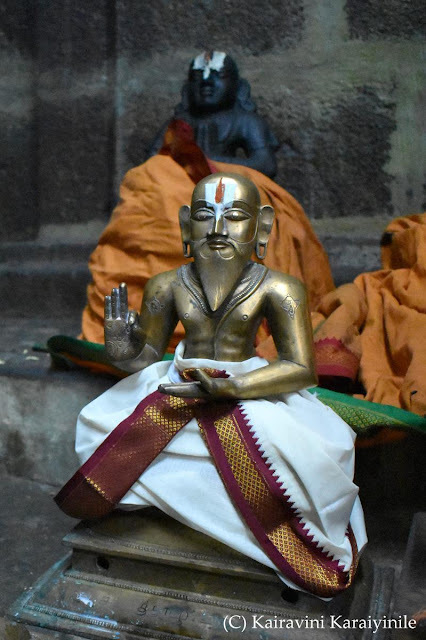 The ``Boddhayana vrutti'', Ramanuja learnt, was lying somewhere in a musty library in the royal library of the then king of an obscure Kashmiri State. For great persons, nothing is daunting or unattainable – our Acaryar accompanied by Koorathazhvan went to Kachmeeram, the King gave Ramanuja and Kuresa permission to access the archives in the royal library. The royal pundits however, were none too happy and created many obstacles. Ramanuja was not allowed to take the vrutti or notes out. Kuresa, endowed with a photographic memory, memorised the whole book. 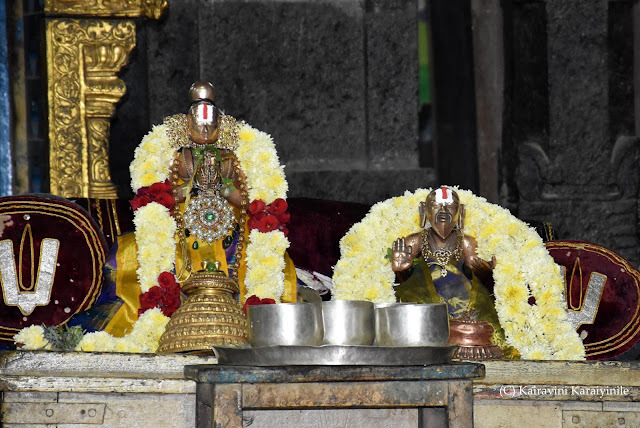 Back in Srirangam, Kuresa and Ramanuja completed the ``Sri Bhashya'' by incorporating authentic references to the ``Boddhayana vrutti'', the growing influence of Sri Vaishnavism once again stoked the malevolent fires of religious bigotry in the land. Amongst some sections of the Saivite population which at that time was concentrated around Gangaikondachozhapuram, near Chidambaram, hatred towards Sri Vaishnavism and of Sri Ramanuja began to flare up. Though blinded in that unsavoury incident, Koorathazhwan who ensured that Yathi Rajar moved safely to Melukote and ensured great kainkaryams there, lived a complete life, devoted in service, with malice to none; in fact seeking good for the traitor too. Koorathazhwan ( Srivatsankamisrar ), gifted us five important stotras, popularly known as Panchastavam. These are Sri Vaikunta Stavam, Athimanusha Stavam, Sundarabahu Stavam, Sri Stavam and Varadaraja Stavam. Before ascetic life, he was a very wealthy person not only endowed with riches – more so with atma gunas and took care of needy by feeding thousands daily. He was never attached to the material riches and the World. 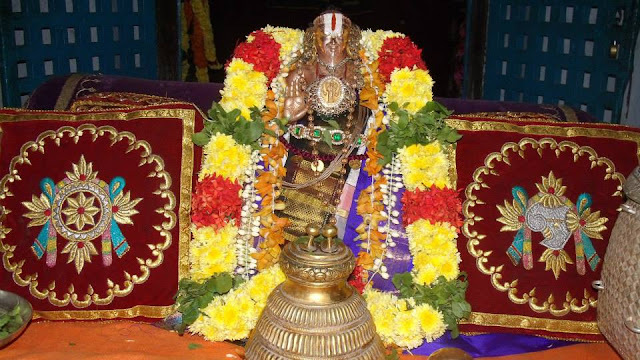 Sri Ramanujar thiruvadigale Saranam; Sri Koorathazhwan thiruvadigale Saranam.